Designed for efficient performance, Chemical Pumps are defined as displacement pumps that are used at the place where smooth cylinder plunger moves from the place of seal and there is a stationary high pressure seal. The mentioned presentation makes these pumps different from other piston pumps, thus make them enable them to work even in high pressures. Known as technically advanced instrument, the available range of pumps is considered as a highly acclaimed industrial metering pump. The basic principle behind working of the pumps is that these causes reverse motion of a plunger that creates pumping action. Chemical Dosing Pumps is membrane type pump which has good suction lift character. Chemical Dosing Pumps specially designed to ensure free flow performance in high capacity and high pressures situations also. Our pumps are specially designed for corrosive liquids including H2SO4 or slurries. Engineered under the firm direction of experienced team members, these handle inconsistent suction conditions and suction lift capabilities to 16 feet. These are straightened with Easy maintenance cartridge type check valves, Hypalont and Vitont diaphragms and Single and double ball check valves to ensure better performance. 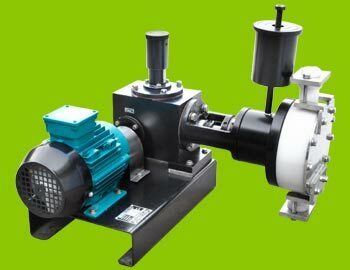 Chemical Dosing Skid is defined as a membrane type pump that is required in the industry for good suction lift character. This is basically a heavy duty hydraulically actuated tubular diaphragm pump, which is designed to ensure free flow performance even in high capacity and high pressure situations. 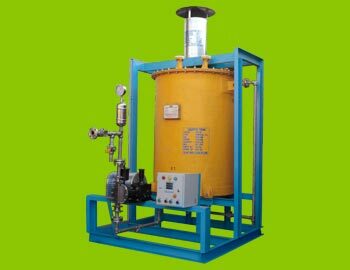 Therefore, it is meant for handling of corrosive liquids like H2SO4 or slurries. Acting as a complete dosing pump system for small or large volume, Chemical Dosing System is extensively used in equipments like boiler, cooling and effluent water treatment. 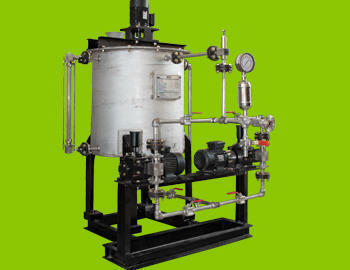 The system is comprised of metering type of pumps along with other important parts, best suited for chemical handling.